Talk about having magnetic personality. LiveTrends Design Group has come out with what the Florida-based company calls “magnetic living art,” pairing non-scratching magnetic ceramic pots with hardy plants that require minimal care. “Water once a month and display anywhere,” according to LiveTrends. How about sticking one on your refrigerator at home or on a filing cabinet at work? A pot would make a great Administrative Professionals Day gift or end-of-school year present for a teacher or bus driver. Plenty of customers are buying pots for themselves, which is OK, too. The pots (each one fits in your hand) come in multiple colors with one of two plant families: succulents or bromiliads. They retail for $8.99 each and are available in all of our stores. LiveTrends has only been around for a few years. Bisser Georgiev started the company after 20 years with Hermann Engelmann Greenhouses, a leader in the indoor houseplant industry. Who wouldn’t want to play with one of these fun magnetic pots? When bosses want to tweet, they only need to turn to their administrative assistants for help. Some 84.3 percent of administrative professionals are social media savvy and are generally more tech-savvy than their bosses, according to Staples’ fourth annual survey tied to Administrative Professionals Day on April 22. Admins also rated higher than bosses when it comes to creative problem solving, sense of humor, being a team player, and likelihood of being described as a friend. Nearly 46 percent of admins have been with their companies for six or more years. When admins were asked who they would most enjoy as their boss, historical figures topped the list in the United States. Movie stars were preferred by their Canadian counterparts. Meanwhile, nearly eight out of 10 survey participants said their company does a good job of making administrative assistants feel appreciated. April 22 provides another opportunity. Flowers aren’t just a nice thing to do for your administrative assistant on Secretary’s Day, also known as Administrative Professionals Day. Research conducted at Texas A&M University found that flowers can help boost workplace productivity. The Society of American Florists worked with the researchers, lending expertise in flowers and plants. In an eight-month study, both women and men demonstrated more-innovative thinking, generating more ideas and original solutions to problems in the office environment that included flowers and plants. Men generated more ideas, while women generated more creative, flexible solutions to problems. So bosses can give their administrative assistants flowers and plants out of respect and out of self-interest. Royer’s stores opened a half-hour early on Administrative Professionals Day, making it easier for customers to pick up flowers on their way to work. Meanwhile, listeners of greatest hits radio station WSOX (96.1 FM) had a chance to nominate a co-worker to receive a free floral bouquet compliments of Royer’s. 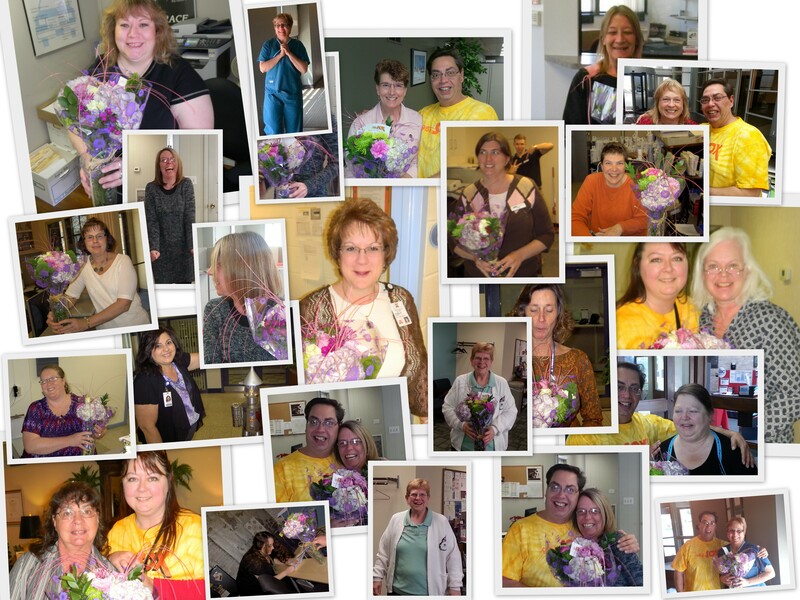 WSOX’s yellow van delivered the bouquets to 20 surprised and delighted administrative professionals in Lancaster and York counties.